No one likes a dry, crispy lawn! Use these ten helpful tips to ensure that your lawn stays a deep and vibrant green even in the hottest summer months. Wetting down your grass or decorative plants in the middle of the day can be disastrous if the day is hot: water acts like a magnifying glass, intensifying the heat on your plants’ leaves and flowers. Rather, you should aim to water your lawn in the very early morning or in the evening after the sun has gone down. If you forget to water your plants in the morning, it’s better to let them wilt a tiny bit and wait for evening than to damage them by watering in the middle of the day. Water heavily, but infrequently. Make sure you give your grass a really good, deep soak when you do water; some homeowners water too little, which can cause roots to stick close to the surface. Others over-water, which can cause rot. How often you water and how much will depend on the type of grass you have planted and your soil type, but a good rule of thumb is to provide 1.0-1.5 inches of water per week to every part of your lawn. If you’re not certain how much water your sprinkler provides, you can use an empty tuna can as a temporary water gauge, and turn the water off when the water reaches the top of the can. Be sure to monitor how long this takes, so that you can set your sprinkler on a timer in the future! A soil with good drainage, such as a sandy soil, might require a bit more water to stay healthy; a soil with poor drainage, such as clay, might need less. Cool-season grasses may require extra attention (and more water) in comparison to warm-season grasses. 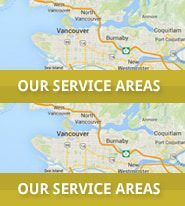 If you live in or around Vancouver or the Lower Mainland area, most grasses in your area will be cool-season, so aim to give your grasses over an inch of water a week. 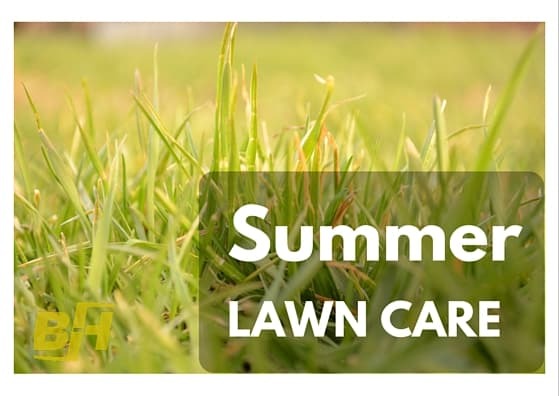 While in the spring and fall, you might have favored a close-shorn lawn, let your grass grow out a bit in the summer. The grass can provide additional shade for your soil, keeping your lawn cooler than a close cut. 3 – 4″ is right for cool-season grasses. Let grass get some natural fertilizer and protection from the elements by leaving the clippings. These provide essential nutrients for your lawn and help protect your grass from getting burned by the sun. Even though your grass should be kept long, you should still mow frequently; otherwise, the clippings can smother your grass or contribute to rot. Smaller bits of cut grass also make for better fertilizer, breaking down more rapidly. Keeping a sharp blade is essential to keeping your grass healthy. A dull blade will tear the grass, whereas a sharp blade will cut cleanly, minimizing the damage to the plant. A good rule of thumb is that a blade lasts for about 10 hours of mowing. Consider keeping extra blades on hand! There’s nothing like moving a toy that’s only been there for a few days, or finding a ‘present’ that a neighborhood dog (and his owner!) have considerately left on your lawn. Sadly, these leave dead and discolored grass behind. To avoid the death and doom of your grasses, take a look at your lawn before watering in the morning, and move any special gifts that have been left the day before. If your lawn has grown dormant (read: dry and crackling) from under-watering during the summer months, it’s wiser to let it stay dormant through the winter than come at it with fertilizer or over-watering. The best times to apply fertilizer are in the spring and fall rather than the summer. As summer comes to a close, consider your next steps to ensure that your grass stays healthy throughout the cooler months to come. Want more advice on lawn care? Contact Bur Han for a free consultation today!